The above statement is a good reminder or our social responsibility to report all aspects of teen issues – those with good, bad and impact – because our audiences have a right to know. These are stories student journalists can tell best. 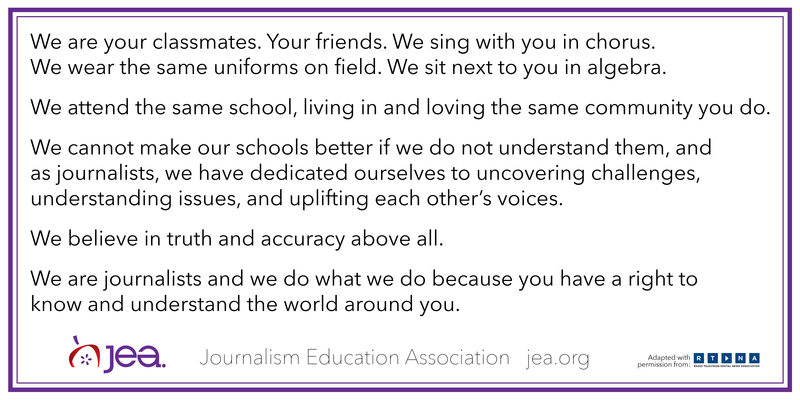 As journalists we do not actively protest, lead walkouts or engage others We examine issues and events with diverse points of view, in context, accurate and complete that might as effectively create change. We are mirrors to reflect events and candles to illuminate causes and issues that surround us, like the March 14 and March 24 planned protests, marches and discussions initiated by student reactions to the shooting deaths of 17 students at Marjory Stoneman Douglas High. Our journalistic leadership should not prevent expression of our personal feelings and views. Our first obligation is to the truth as Bill Kovach and Tom Rosenstiel write in The Elements of Journalism. In this case and others, student media can best tell that story. We lead when we channel our insights into reporting so communities – or societies – can make intelligent and informed decisions affecting our democracy. To assist students as they report events and issues surrounding walkouts and protests, local and national, the SPRC begins a series of blogposts focusing on protest in America, its relevance and why student media should make every effort to report on its deeper issues. We start our discussion with the following links and will continue March 19. Covering controversy Controversy is often in the eye of the beholder. The best way to prevent a subject from becoming controversial is to use verifiable information, in context, from reliable sources – truthful, accurate, thorough and complete reporting. Students should be able to show why they used some information and not other. They should be transparent about why their coverage was important. Practice sensitivity in your reporting How do we, as today’s information consumers and creators, sift through the rumors, the gossip, the failed memories, the spin to capture something as accurately as possible? How can we overcome our own limits of perception, our biases, our experience and come to an account people will see as reliable. This essence of journalism is a discipline of verification. Controversy is in the eyes of the beholder. Our job is make sure anything controversial is reported thoroughly, accurately and coherently. Respecting privacy and public space important for photographers, too Student journalists should never invade the privacy of others while accessing information or photos for a story.However. it is their journalistic duty to know what constitutes invasion of privacy or what spaces they are legally allowed to access and what spaces they are not legally allowed to access. Student journalists should check the legal and ethical parameters of public space and the latest recommendations for journalistic activity from the Student Press Law Center. Covering walkouts and protests From the SPLC, this guide provides helpful information student journalists reporting protests and walk-outs.